Salvo Montalbano is the leading character in a series of Italian mystery novels written by Andrea Camilleri. Salvo is a decent and humane man with a fiercely independent streak who happens to be a police commissioner in Sicily. He fights corruption, solves crimes, has girlfriend problems, and never fails to enjoy a good meal. Normally I'm not much of mystery reader, but the series is well written and the characters are appealing. The books capture a real feeling of life in Sicily. The highlight for me though is the opportunity to experience Sicilian food vicariously with Montalbano. You can bet that no matter how grim or perplexing the crime, Montalbano will sit down to a good meal and a bottle of wine either at his beachside home, prepared by his faithful housekeeper Adelina, or at some truckstop or trattoria on the way to or from the crime scene. Recently, my friend Diane Darrow picked up a copy of I Segreti della Tavola di Montalbano--Le Ricette di Andrea Camilleri (The Secrets of Montalbano's Table -- The Recipes of Andrea Camilleri) by Stefania Campo. Diane is a great home cook and the author, along with her husband Italian wine expert Tom Maresca, of several Italian cookbooks. Undaunted by the lack of detailed info in the recipes, Tom and Diane decided to undertake a Sicilian dinner Montalbano-style and Charles and I were delighted to attend. 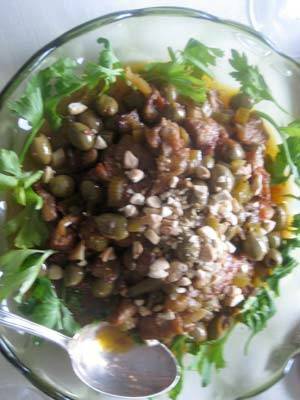 The meal began with Adelina's Caponata from Excursion to Tindari. The flavors of the eggplant, onions and celery were balanced though it had less tomato than I am accustomed to and was topped with crunchy toasted almonds. Altogether delicious. Next came the Pasta col Ragu Siciliana (also from Excursion to Tindari), which was as good as it looks. 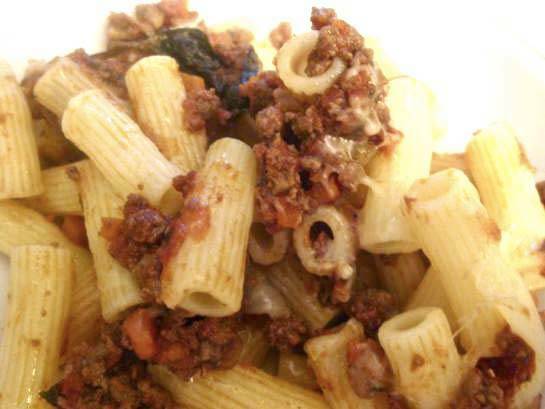 The ragu was made with sirloin that Diane and Tom had ground themselves and the pasta was topped with caciocavallo, a classic Sicilian cheese. Our main course was a dramatic 'mpanata di maiale, from The Wings of the Sphinx, a baked drum of bread dough stuffed with sauteed sausages, potatoes, olives and cauliflower. 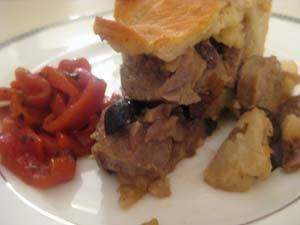 Diane accompanied it with roasted red peppers, the ideal complement. Tom selected the wines for the dinner. Though we started with a magnum of French Champagne, at the table there were three Sicilian reds: Don Antonio from Morgante, and the Rosso del Soprano and Faro from Palari, which we all enjoyed. 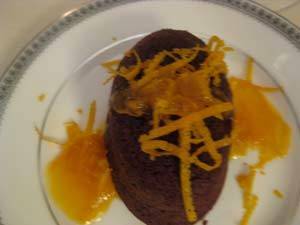 Little dark chocolate cakes with orange sauce (sformatino di cioccolato amaro con salsa all'arancia) from The Snack Thief were a nice finish to our memorable Montalbano dinner. Salvo is a lucky character to eat this well in every book, and we too felt lucky to share it with Diane and Tom. Click here to read more about this dinner and Diane's kitchen adventures.